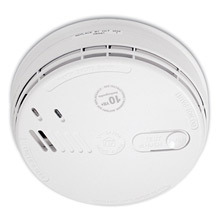 Smoke Detectors, Carbon monoxide detectors and heat detectors in your property should all be interlinked. The amount and locations of your detectors will depend on the size and nature of the property. For example if you have a three or four storey property and the smoke alarm is triggered on the ground floor, it is quite possible that you wouldn't hear it. This is why we must interlink them so if one sounds, they all sound. It makes perfect sense. This can be achieved in one of two ways or a mixture of both. Installation permitting we would normally take initial power to the closest detector to the consumer unit. Then we would daisy chain from one to the next, to the next and so on. However, in many cases the property is decorated and lived in, so retrofitting cables right from top to bottom of the property if simply not financially viable. 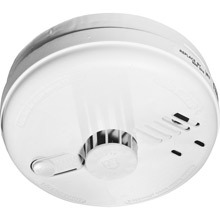 In these cases we can install radio linked smoke alarms, carbon monoxide detectors and heat detectors. This solution greatly lowers the need to get into the structure of the building thus reducing costs and disturbance. Radio linked devices can be battery powered with a life of up to ten years. It's simply a matter of screwing them to the ceiling and syncing them. 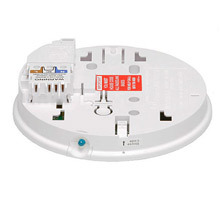 We prefer to install mains powered detectors and can nomally find a useable power source nearby.